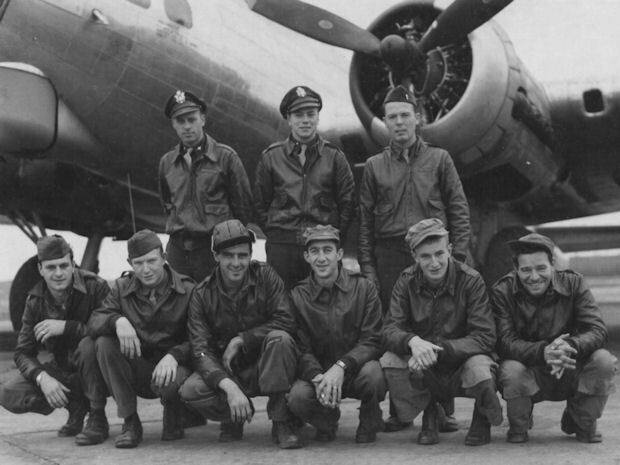 Crew had no Navigator when they were assigned to the 360th BS. Flew with various Navigators for first 10 missions. Lt Robert B. Wade (B) , a dual rated Navigator/Bombardier, became the regular crew Navigator on 21 July 1944. Crew then flew with various Bombardiers or Toggliers. S/Sgt Lester E. Champion (R) flew as Radio Operator on the Crew's first two combat missions. He was replaced on 08 July 1944 by Sgt Earl E. Wiggans (AR/WG) who was also a trained Radio Operator. Sgt Morris B. Glaser (TG) - Removed from flying status and crew on 24 Aug 1944 after 18 missions following an attack of aero-sinus at high altitudes. Changed name to Lee Tavvab in 1961. Tavvab is an Islam word meaning "Repentant."